A Mediterranean breeze blows in with the amorous songs of Jairo Zavala’s new project DePedro and its self titled debut. 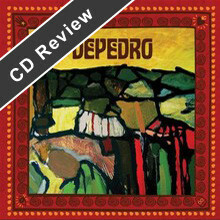 DePedro has all the musical ingredients of a stunning success. Jairo was raised in Madrid and credits his influences to music his Peruvian father brought back from Latin America and Africa, and pre-WWII songs his grandparents played, combined with the popular rock songs in Spain in the 70s and 80s. “Como El Viento” sweeps in as a Spanish love song as Jairo sings, “Your breath is enough to make me feel like the wind.” A gifted guitar player and singer, Jairo’s melodies underscore his stylistic flair. In “Don’t Leave Me Now”, the baritone sax and trumpet dance back and forth in a sultry exchange, leaving the warmth that one gets from a candle on a cool night. Jairo pours out his passionate voice in “Llorona”, reaching octave ranges that he scratches and crawls out at. It brings incredible integrity to a burning track. A truly vibrant album that combines blues, folk, flamenco, rock and Latin into a cherished potion meant to broaden soulful horizons. “Comanche” and “Tomorrow” provide a wonderful tempo that brings remarkable dynamism to the roasting “Equivocado” and “Miguelito”. Jairo’s talent shines like a full moon on the dark Arizona desert. The ensemble he has brought together for DePedro creates a sound that is living and breathing and knows no boundaries. With a six shooter in hand and a cool blue sky beaming as cowboy boots mash the auburn desert sand, DePedro brings the swagger of a loving outlaw riding out on his stallion to right all the wrongs, and to hell with order.